Local and international businesses have come to the inaugural South African Investment Conference bearing gifts in the form of investment commitments to the tune of R134 billion. President Cyril Ramaphosa sat beaming at the podium in the conference hall as various companies from South Africa, the continent and the rest of the world pledged multibillion rand investments over the next five years. The investments are aimed at reviving the South African economy. 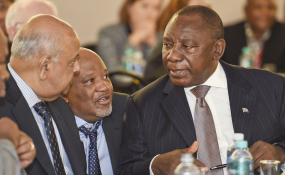 During in his welcome address, President Ramaphosa said the investments were a culmination of a six-month investment drive by the four envoys tasked with globetrotting in search of over R1 trillion worth of investments over the next five years. First in line was Sappi chief executive Steve Binnie, who pledged R7.7 billion in half a decade. "We have recently exploited an opportunity at our site in Durban. This investment allows the opportunity to build capacity to dissolve pulp. You may or may not know what dissolving pulp is but its fibre that ultimately goes into the manufacture of textiles. About 7% of the textiles in the world come from dissolved pulp. Sappi is the largest producer of pulp in the world and we predominantly do that in South Africa," he said. "We have a world class facility in South Africa. We contribute about 1% of South Africa's export from our mill down in Durban. We have the opportunity to grow further and contribute to the South African economy. We are very excited about the prospects," said the CEO. Fellow packaging and paper producer, Mondi, did not fall far behind, announcing a R8 billion investment commitment in the same period. A Mondi representative said the company earned R4 billion annually from exports. "I'm very proud," she said. "We are very proudly South African. We are passionate about performance. We are global competitors. We are investors of people. We want to be part of building South Africa and we want to reach across the table. We have been reaching across the table for years," she said. The company had a 15 year old partnership with government on land reform. Zinc producing Vendata Resources CEO Srinivasan Venkatakrishnan upped the stakes, announcing that the company was committing to invest invest R21.4 billion. This would include a venture in the Northern Cape. Bushveld Minerals and Ivanplats pledged R2.5 billion and R4.5 billion, respectively. Andile Sangqu, Anglo America chief executive who pledged R71 billion, was optimistic about the future. He said the company believed the country's mining sector was poised to attract the much-needed investment to support job creation. "Mr President, we are encouraged by the Thuma Mina call which will build a better South Africa for all. We have heard your clarion call. We are proud to announce our investment commitment. We pledge to invest $6 billion between 2018 and 2022 on sustaining the lives and our mining operations in South Africa," he said. He said the company would be preserving the 72 000 jobs at its operations during this period. Automobile manufacturer Mercedes-Benz announced a R10 billion investment committment into its Eastern Cape plant. Information communication technology powerhouse NASPERS made a R6 billion pledge. New kid on the block network provider Rain said it would from next year roll out a 5G network valued at R1 billion. The Uganda-based smart phone producer, Mara, will at the cost of R1.5 billion be "setting up shop in South Africa sooner than anticipated," according to CEO Ashish Thakkar.